We often hear how an increasing global population is depleting the Earth’s resources and destroying the environment. 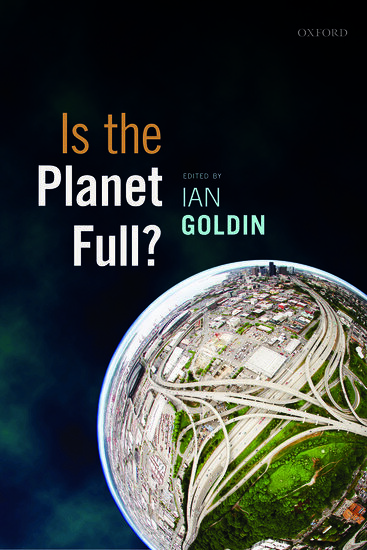 However, in this book, Ian Goldin and colleagues argue that our planet might be far from full if we better managed our resources, reduced environmental degradation, and improved economic and technological development. Rebecca Jarvis recommends this for anyone interested in understanding what an increasing global population means to our present and future. Is the Planet Full? Ian Goldin (ed.). Oxford University Press. May 2014. In the last forty years the world’s population has doubled to over seven billion. Recent estimates suggest that whilst the rate of population growth is slowing, the global population will reach between nine and ten billion by 2050. However, this increase will be unevenly spread across the world. While fertility rates are at or below replacement levels in two-thirds of the world’s countries, Sub-Saharan Africa, South Asia and some parts of India are the only areas expected to see rapid population increases as our the planet expands by several billion people. Further, four billion people around the world are predicted to shift towards middle-class lifestyles, habits, and increasing levels of consumption whilst global resources continue to decline. In Is The Planet Full? Ian Goldin and colleagues argue that focusing on population size alone is too narrow a view of whether or not the planet is full; we also need to consider where and how people live. Goldin brings together colleagues from the Oxford Martin School to each contribute a chapter from a different perspective, covering topics across population ethics, economics, demographic and environmental change, resource management, human health, and governance. The book highlights the paradox of a world troubled simultaneously with obesity, malnourishment, and hunger, of increasing resource consumption with increasing scarcity, and of self-reinforcing institutional systems favouring the powerful elites whilst those who are most vulnerable and at risk become even more so. In Chapter 4, Sarah Harper explains how demographics are changing all over the world, increasing tensions between the demands of a growing population and the constraints imposed by climate change. Many low-income countries have high fertility rates in areas that are also at greatest risk of severe climate events, environmental degradation and sea level rise. The same people are also at risk of being trapped in areas more prone to war, armed conflict and persecution, with increasingly poor access to adequate healthcare or education. The book argues that migration offers a powerful tool for reducing poverty and inequality, and can be used to address critical issues of global resource allocation so that people do not become trapped in socially, politically or environmentally disastrous circumstances. Harper’s contribution highlights how ten billion people may be able to equitably exist on a finite planet through increased mobility and redistribution of resources, but only if our exploitative relationships between population, consumption and the environment are simultaneously addressed. In Chapter 6, H. Charles J. Godfray outlines how an increasing population provides a “real danger that demand for food will rise more rapidly than the world’s ability to supply it, leading to price rises of a magnitude that would risk economic and political instability” (p.105). Increasing demand for greater and more varied food resources by the wealthy will increase competition for water, land and energy whilst highly protectionist policies and financial subsidies will continue to bias the market towards powerful interest groups and away from sustainable practice. Godfray suggests that global food security is possible, but only if we acknowledge existing power relations and balance out distorted food markets. In Chapter 10, Anthony Hartwell illustrates how technological advances mean we are extracting resources faster, more efficiently, and from areas we never could before. Hartwell argues that we need to transition to lifestyles that take long-term sustainability in to account, but that any pathway that will reduce the risks of climate change will also require the utilisation of resources. An increasing population provides increasing demands, and a shift from consumption towards eco-efficiency, recycling and reuse may be the only way of ensuring we still have access to resources in years to come. Hartwell argues there is room for optimism, but the chapter could have been strengthened by including discussion around emerging, developing, and least-developed regions of the world where long-term sustainable practice may be pushed down the agenda in light of more immediate local concerns. In his summary chapter, Goldin highlights how each of the issues discussed in the book are mediated through social and political institutions. Goldin argues it is really not about numbers; “the question of whether the planet is full or not rests on our ability to address critical governance challenges” (p.231). Whilst globalisation has increased, the international community has paid little attention to global governance and cooperation, and many nations continue to act in their own self-interest. Goldin argues that “whatever can be best resolved locally, nationally, or through bilateral or regional relationships should be” (p.218), but that stronger global governance is required to solve the growing number of international issues that face our increasingly interconnected planet. Ultimately, Is the Planet Full? argues that the world we live in may already be overpopulated due to our current institutional arrangements failing to adequately manage resources in an equitable and sustainable way. Goldin and colleagues highlight that counter to popular opinion “the planet may be far from full” (p.228), but only if we address key governance challenges in managing our societies, economies and environment. Readers looking for up-to-date facts, figures, and forecasts will be disappointed and, inevitably, there is no definitive answer provided by the book. Instead, its strengths lie in collecting together the diverse opinions of different thought leaders to provide a holistic interdisciplinary discourse around how we treat the planet and each other. A noteworthy overview of how we manage global issues, Is the Planet Full? is recommended for anyone interested in understanding what an increasing global population means to our present and future. Rebecca Jarvis is a PhD candidate studying interdisciplinary conservation science and social-ecological systems at the Institute for Applied Ecology New Zealand at Auckland University of Technology. You can find her on twitter: @rebecca_jarvis or her website: www.rebeccajarvis.info. Read more reviews by Rebecca.